Space is great, and it is very fun to have an agency that funds research missions to explore things far from our little planet. On Wednesday, NASA announced two new potential robotic missions: one to the comet 67P/Churyumov-Gerasimenko, and one to Saturn’s moon Titan. These missions are the finalists from 12 proposals submitted to the New Frontiers program back in April. Only one of them will move forward and launch in the mid-2020s. Last year, we watched the European Space Agency’s comet-orbiting Rosetta craft meet its end by slamming into 67P/Churyumov-Gerasimenko. NASA has selected the Comet Astrobiology Exploration SAmple Return, or CAESAR, to one-up the Rosetta mission. CAESAR will hopefully bring a piece of the comet back to Earth. Steve Squyres of Cornell University will lead the project. Scientists think that comets contain materials from our early solar system, such as ancient ice, rock, and even complex carbon-based molecules. Bringing a physical sample back to Earth will help us discover how these materials played into the formation of our own planet. 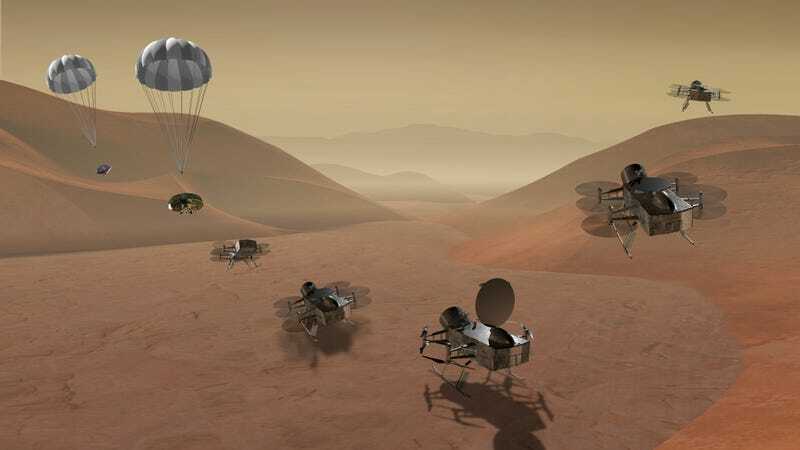 NASA will also fund Dragonfly, literally a super-high-tech quadcopter that would explore several sites on the surface of Saturn’s huge moon Titan. Titan is the second-largest moon in the solar system, larger even than planet Mercury, and has a dense atmosphere. Elizabeth Turtle from the Johns Hopkins University Applied Physics Laboratory leads the Dragonfly mission. Titan is a weird one—it’s got oceans like ours, with hydrocarbons instead of water. The planet is full of complex carbons of its own—ones like vinyl cyanide that could potentially form “membrane-like” stuctures. It has carbon in its atmosphere, too, as well as precipitation like we have here on Earth. Basically, it could host a very weird form of life, maybe. On top of that, NASA will partially fund two other concepts to prepare them for future competitions. One, called ELSAH, is designed to find ways to de-contaminate spacecraft in order to better find life. The other, VICI, is a mission designed to withstand the tough conditions on Venus. We won’t get both the CAESAR and the Dragonfly missions, unfortunately. NASA will fund both until the end of 2018 to allow the teams to mature their concepts. In the spring of 2019, it will select one of them to move forward. I’m on team Titan, personally. But may the best concept win.